I have learned a lot from you and I know many of my traits come from you. I know I learned a lot of practical handyman type things like painting, caulking, replacing a glass pane etc. As you know, I put those to work in my first business. That success was my entrepreneurial start. I learned much about business from you. I am sure my success is a direct result of what I learned. You taught me that business is not only OK, but it is good. You helped me form my leadership and management style. You helped me bring systems to the business before I knew we needed them. I gained a love of gardening. Yours was always so weed free compared to mine(and I am sure very little of that was your 4 sons). Your yield was actually much higher than you thought due to the "son" discount especially in the raspberry and blueberry department. My compost takes longer but I still do it. I see your discipline and the success habits you have. I envy those and copy some of them. I learned young that exercise was good. And just like you, I track my workouts. (and I still think you should enter a 5 K to win the 85 year old age class). From you, I learned work ethic. I learned that work is rewarding. You learned a frugality from the depression that rubbed off on me and has served me well. I know I would not have had the success in business had I not had that frugality. From you I learned a love of camping. I still enjoy the wilderness or just simple hiking. I know you wanted us to learn some things that you did not feel good in and we did. EG - swimming. My study of time management was inspired by your naturally tidy, organized and disciplined approach to life. For me, it is not natural so I need to study it. I learned integrity by watching how you live your life. Your high integrity. Your word is your bond. A handshake beats all the legal paper in the world. I know Glen and I once chatted about how much easier business would be if everyone was like dad. And I am still learning from you. I appreciate your steadiness. And did not want Josh to feel left out. And from Josh (my fathers great grandson) I can learn wonder. He is so enthralled with everything the world throws his way. He looks at everything with wonderment. Fabulous entry...Happy Father's Day Jim!!! Great post. I didn't get any of Don's organizational skills. Nor did I take to his frugality. But I did adopt his deep sense of family. I am lucky to come from such a great family. Dad once told me that whenever he needed guidance about if something was ethical in business, he only had to think about "What would Don do? ", and that would be his guidepost. And it must work, because all I have to do is ask "What would Dad do?" and I've got my ethical bearings. I have also learned much from my Grandpa Don, my love of the Toronto Blue Jays for instance(through the good and bad seasons). And the fact that bringing a homemade sandwich (on homemade bread) is the perfect snack at the game. From my dad I learned to embrace spontaneity and to appreciate nature. Josh is lucky to come from such a long line of strong Estill men. 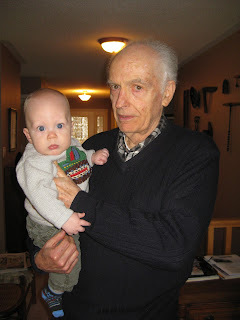 I've also learned a lot from my Grandpa--for instance, a love of the Toronto Blue Jays (through bad seasons and good). And, of course, that homemade sandwiches on homemade bread are the perfect snack at the ball game. From my Dad, I've learned to appreciate nature and embrace spontaneity. I'm lucky to have such a great father and grandfather--and Josh is lucky to come from such a long line of strong Estill men. Since I'm the oldest grandchild, I've obviously learned the most from my grandpa--that is, of all the cousins. I was the first to learn about cards from Grandpa, like pinochle. I started learning card games before I could even properly hold my hand of cards. Grandpa was patient. We must have played dozens of games of crazy eights and solitaire before I was ready for the big leagues (pinochle). I can only aspire to his patience. Grandpa is kind, thoughtful, and caring. That's the kind of person I try to be too. And as for my dad, who learned so much from his dad--he's pretty awesome too. I learned about working hard, staying healthy, and canoe portaging from him. Thanks, Dad! And thanks, Grandpa, for raising such great sons.